"Sampath Speaking" - the thoughts of an Insurer from Thiruvallikkeni: Remembering the patriots - VO Chidambaranar who ran Swadeshi shipping !! 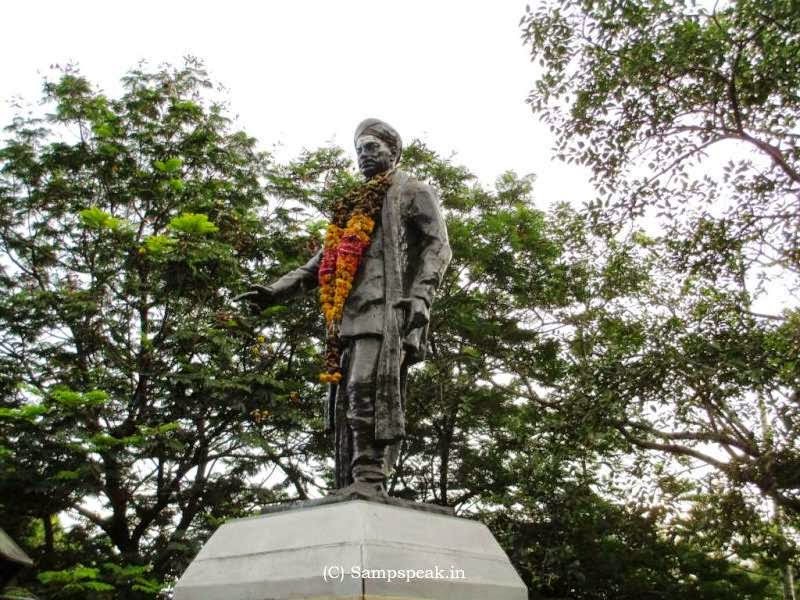 Remembering the patriots - VO Chidambaranar who ran Swadeshi shipping !! ~ and in a most harrowing punishment, he was to replace the animal in a primitive implement – the oil press. It was - Vandanam Olaganathan Chidambaram Pillai (VOC) born on 5th Sept 1872 to eminent lawyer Ulaganathan Pillai in Ottapidaram, Tuticorin Dist. Like his father, he also became an advocate and often pleaded for the poor. He was attracted by the Swadeshi movement by Bal Lal Pal, a time when Gandhi was not at the National scene. The fight was against the Imperial policies of British which were threatening the very existence of trade, commerce and the communities that were dependent on them. In Madras Presidency this was championed by the likes of Subramanya Siva, Subrahmanya Bharathi, Aurobindo Ghosh. VOC also presided the Salem Congress Session. His exemplary fighting qualities made him establish the “Swadeshi Steam Navigation Company” during Nov 1906 by purchasing two steamships ‘S.S.Gaelia’ and ‘S.S.Lawoe’. This indeed is an exemplary act when somebody can imagine the stringent measures and imperialistic attitude of the Britishers who crushed any such activity by brutal force. By running ships, he challenged the monopoly enjoyed by the British India Steam Navigation Company, formed in 1856. VOC did everything to create awareness of imperialism and mobilised the workers of textile mills in that area. On 12th Mar 1908 he was arrested on charges of sedition. Mahakavi Bharathiyar and Subramanya Siva appeared in the Court in the case and VOC was sentenced to double life imprisonment tantamount to 40 years and confined to prison. He was treated badly as a convict and subjected to inhuman torture. History has it that he was yoked in place of bull in the oil press and made to work cruelly. He was later released in Dec 1912. Upon release, he was not permitted to return to Tirunelveli, his bar license had been stripped, his Company had been liquidated and ships auctioned. VOC died on 18th Nov. 1936 in chill penury. One of his sons contested from Ottapidaram in 1967 TN Assembly but lost. He was also an erudite scholar. 5th Sept 2014 marks his 142nd Birth day. I for one is against celebrating birth days of those persons who are no more. Still, it would remain a day worthy of remembering and recalling his commitment, strong will and sacrifice. The young generations of India should read his life as an example of resistance, strife, struggle, suffering and sacrifice. 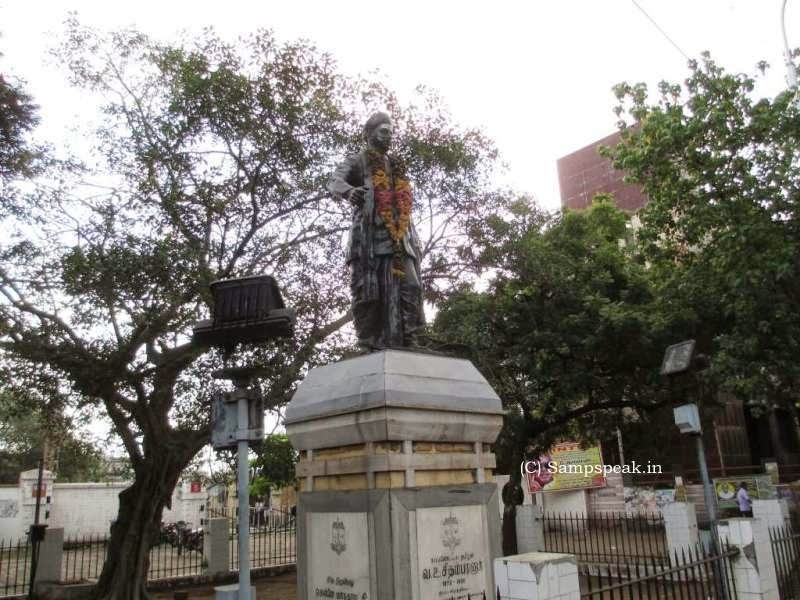 Here are couple of photos of VOC statue in Beach Road, near Beach Railway station in Chennai. PS 1 : Kappalottiya Thamizhan, a 1961 film – the story of VOC based on biopic written by Ma.Po. Si. (M.P.Sivagnanam); directed by B. R. Panthulu, the film featured Sivaji Ganesan and Gemini Ganesan in the lead roles. The film reportedly failed at box office.